Don’t panic! It’s okay. Now that the flood water has left your home, you should be okay, right? Sure, you may have to do a little bit of clean up here and there, but we’re just talking about water. It’s not going to be that difficult to get your house or business back in order. Or is it? Here are a few reasons why you should seriously consider flood cleanup services in San Francisco. 1 – Its Only Just Water, Right? Well, that may be true but you have to consider the source of that water to get a firm understanding of the potential risks. If the flood in your basement is the result of a plumbing issue, like a burst pipe, the risks are different to those that would be present if the flooding happens to be the result of a river overflowing. Then there’s that water bed on the second floor of your apartment building that exploded (don’t ask how that happened – you don’t want to know) and it’s now dripping into your multimedia room. It may only be water but it is going you mess you up big time if you don’t take the proper flood restoration steps. 2 – Why Is That Smell Still Around? Flood waters – and in particular those from a river, a backed up sewer system or some other natural source – carry contaminants. They may not be easy to spot in a room filled with murky water but take our word on it. You don’t want any of that nasty business to lurk any longer than necessary. With proper flood cleanup procedures the contaminants are eliminated. In case you didn’t think about this part, those bad little germs can make you sick and give you regular reminders of the flood incident long after the room is dry and useable. We’ll give you that one. Sure, maybe you don’t have a high flood risk. However, there is no such thing as two identical floods. Plus, they don’t normally call ahead to see if you have room in your garage, yard or basement for one to rush in for a quick visit. Floods are sneaky. They can happen in ways that aren’t always connected to a natural disaster. Maybe someone forgot to turn off the tap in the downstairs laundry room. Maybe the washing machine sprung a leak. Or what if the walls of the above ground pool in the back yard fail? 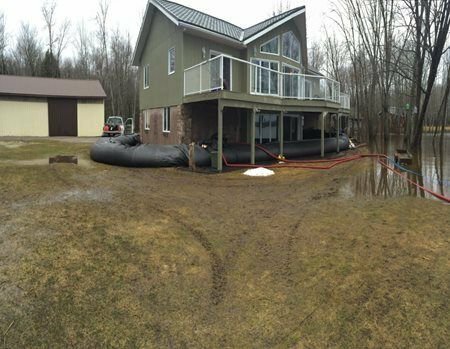 Floods happen and you just need to know that professional flood cleanup is part of what we do.